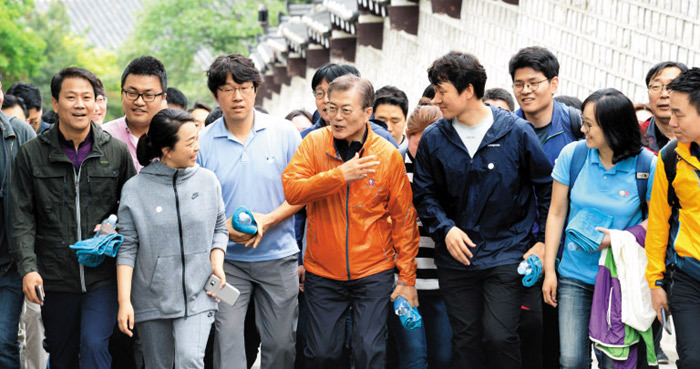 President Moon Jae-in spent the first weekend since his election hiking up the mountain behind Cheong Wa Dae on Saturday accompanied by around 60 reporters who had covered his campaign. He was joined by his new chief of staff Im Jong-seok, spokesman Yoon Young-chan and other Cheong Wa Dae officials. Mt. Bugak, which sits right behind the presidential compound, was also a favorite hiking spot for former President Roh Moo-hyun, whose right-hand man Moon used to be. Much of it is heavily guarded and off-limits to civilians. Moon was advised to take a day off and came up to the idea of going up to the mountain with the reporters who pounded the pavement with him during his presidential campaign, according to a spokesman. The president chatted with them and posed for selfies during breaks on their 4.4 km hike. The trek was originally scheduled to take 50 minutes but lasted around two hours as the group walked at a leisurely pace and chatted along the way. He then had lunch with them in the Cheong Wa Dae cafeteria. On Sunday the president and first lady moved from their house in Hongeun-dong in northwestern Seoul into Cheong Wa Dae. Moon had commuted since his inauguration because the presidential office was being renovated. As they emerged from their old home they were met by around 100 residents of their neighborhood. They finally left Hongeun-dong at around 5:20 p.m. and arrived at the presidential compound 40 minutes later. First lady Kim Jeong-suk had made several visits to Cheong Wa Dae to deliver snacks and food to the builders who were involved in the renovation.